Congratulations to tour winner Victoria A. and to host winner Linda Nightingale...Musings. 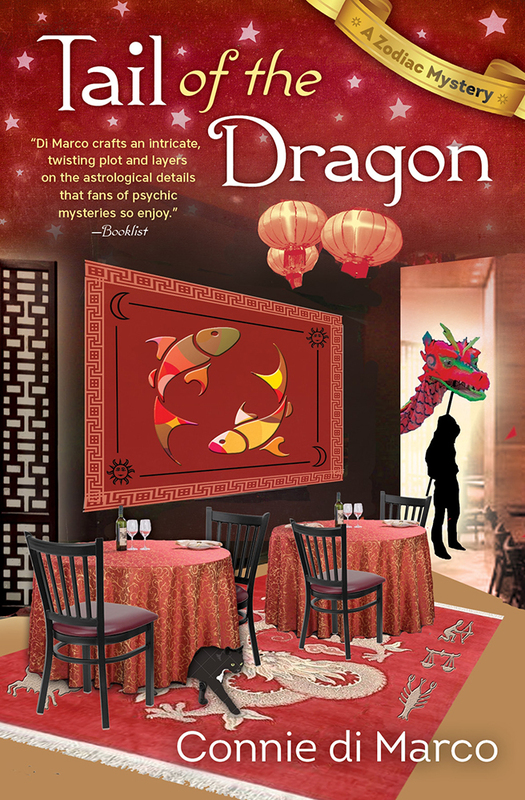 Goddess Fish Promotions is organizing a Virtual Blurb Blitz Tour for Tail of the Dragon by Connie di Marco, a Mystery available August 8 from Midnight Ink. The tour will run August 13 - September 7, and this tour will not include interviews or guest blogs; however, a blurb, excerpt and author bio will be provided to every host for inclusion on their blog. A PDF copy of the book is available for review in conjunction with a promo post. Connie di Marco will be awarding a $20 Amazon/BN GC to a randomly drawn winner via rafflecopter during the tour, and a $20 Amazon/BN GC to a randomly drawn host. San Francisco astrologer Julia Bonatti never thought murder would be part of her practice, but now, Julia’s former boss and current client has asked for help. He has serious problems at his law firm. Three people have received death threats and the only common denominator between them is a case long settled -- the infamous Bank of San Francisco fire. Julia’s convinced a woman is behind the threats, perhaps even the widow of the man who died in that same fire, but no one wants to believe that astrology could provide a clue. Before Julia can help her client, two lawyers are dead and her own life is threatened. Can she unmask the killer before he (or she) takes another life?